I use to do peek at my week, but wow is life busy...so busy I get my lessons done, get supplies for 6 science preps, and we are full speed ahead! I am sure glad last year I did that. I can look back and get some ideas, find my links and videos and more. So....I figure, I better post a peek so that I can once again get back on track to showing what I do each week in my science school yard! Kinders- We are learning about the stars. We start with a great online book from We Give Books called Starry Sky. I made constellations from Full of Great Ideas Blog. As I read, I had the constellation cards shining on the ceiling when we saw it in the book. The kinders actually remembered them! Our project consisted of giving each one a piece of black paper, 6-7 pieces of popcorn, and a piece of chalk. They tossed the popcorn on the paper, picked up a piece, ate it, then placed a star in its place. Then the kids were able to see a constellation. When everyone was done, I played a virtual camp fire, they got a story stick to pass and share their pictures. We finished with a five little astronauts song. First Graders- Are working on balance once again. 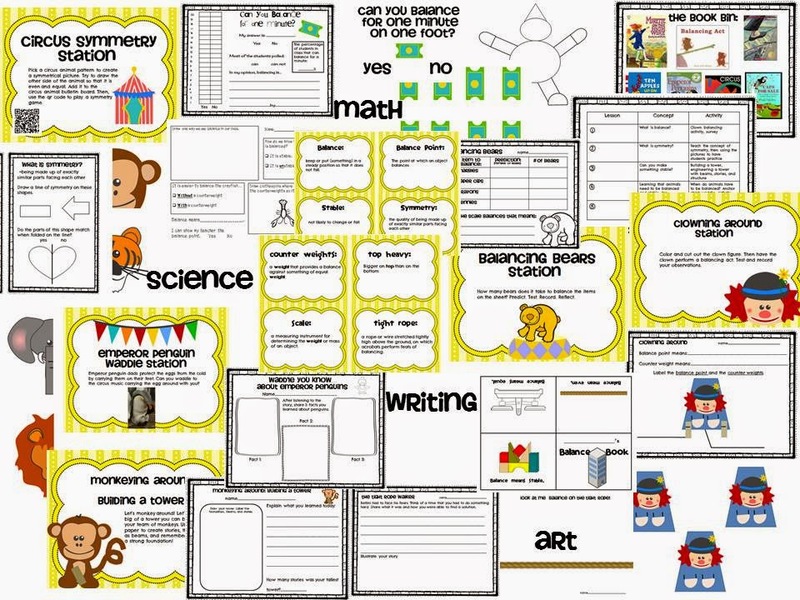 I created a pack that took the picture books I could find, the FOSS lesson concepts, but added a fun circus theme to it. There are a ton of great balancing videos that kiddos love to watch as well. Balance: Science Circus Fun is a great way to teach balance, add math, reading, writing, and more to your FOSS balance and motion kit and then some! 2nd graders-Are all about the Non-Newtonian Fluids. We once again used our What's The Matter? Pack to supplement mixtures and solutions. Last week, Oobleck, this week...toothpaste! 3rd grade- My middle children are finishing up on the water cycle. We are working with ice cubes. We used ice cubes to learn the three phases of matter. 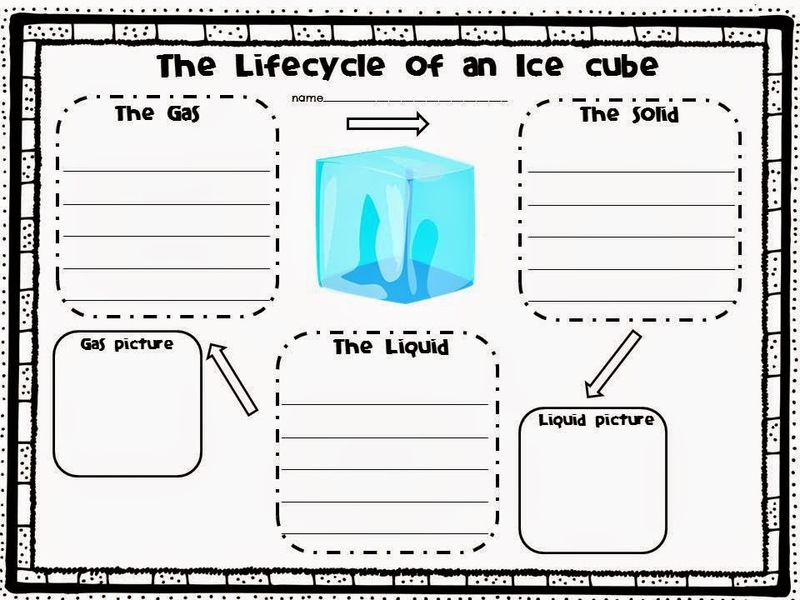 Here is a great time lapse I showed as they worked on the phases of the ice cube sheet...this fun 15 second you tube video Life Cycle of An Ice Cube. This sheet is from my FOSS Water Extensions Pack. 4th grade- The Digestive System...what a fun way to learn about our body... engineer a model of it! Take a look at what they did! Then onto the team activity. They got 20 minutes to include the parts of the digestive system and then share it with the class. It was a great way to remember it! We then did this great penny polishing activity that had the kids reacting, too! Did you know that ketchup is a great polisher? Who knew...We also used BTB to test a color change in water as we blew into it and tested for acids and bases. We always do a ticket out the door...this one was 5 examples of chemical reactions and what does BTB indicate. They got it! Using BTB...showed a color change from blue, to green, to yellow! BTB showed cola to be an acid... and it cleans pennies! But the winner...hands down...was ketchup! It was a great week in the Science School Yard!